..., and there it goes, sailing off into the world after the official launch. What places will it see? Who will it meet? Only time will tell. Oh no, I missed the boat. These cheat sheets took longer than I expected, and I still need one or two. It is cleaner. This is just a reminder about the language, so we don't need to go into too much detail about any particular tokens. Some of them are also inconsistent with each other, so C uses X+, X- but Y uses +Y, -Y.
I like the separation into sections. We do seem to have lost the multi-nuclei atoms though. I assume you are working on another image for those, since they wouldn't fit onto the last one. In order to reduce clutter, have a think about removing a lot of the images and only using 1 per section, probably at the title of that section. Basically just a reminder of what that section contains. 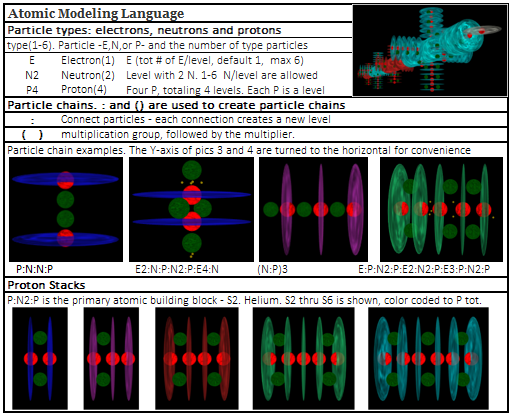 I liked the multi-nuclei atom image you first added. That worked well and was necessary because it is a complicated topic. Showing each proton stack is not really needed for a cheat sheet. The top-right corner image on the first sheet in your last post is good and I think doing the same for the other sections will work well. I tried to provide an alternative last time, two of three sheets, loosing myself in the weeds. 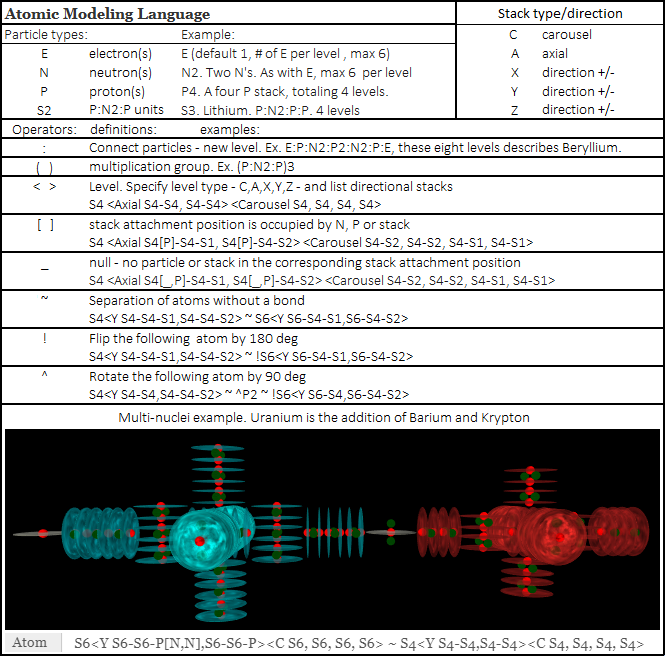 Thanks for the review, the <> XYZ inconsistency still throws me, not to mention the + or - start to A or C nuclear chains. I think this may be a draft final; on the other hand, I always make mistakes, so If you'll be so kind, again, please find fault. Much cleaner. I like it. Why does it have the parentheses? It is confusing because they refer to a multiplication group. I think you are trying to show that it needs a number after it, maybe use the character i in italics, and then state that i must be 1 to 6 inclusive in the description. I would normally use N, but that is also a language token. Remove the : as it is not used to create nuclear chains, only particle chains which can be used in a nuclear chain. It is a bit confusing, but the nuclear chain is taking lower level entities and creating a chain out of them. 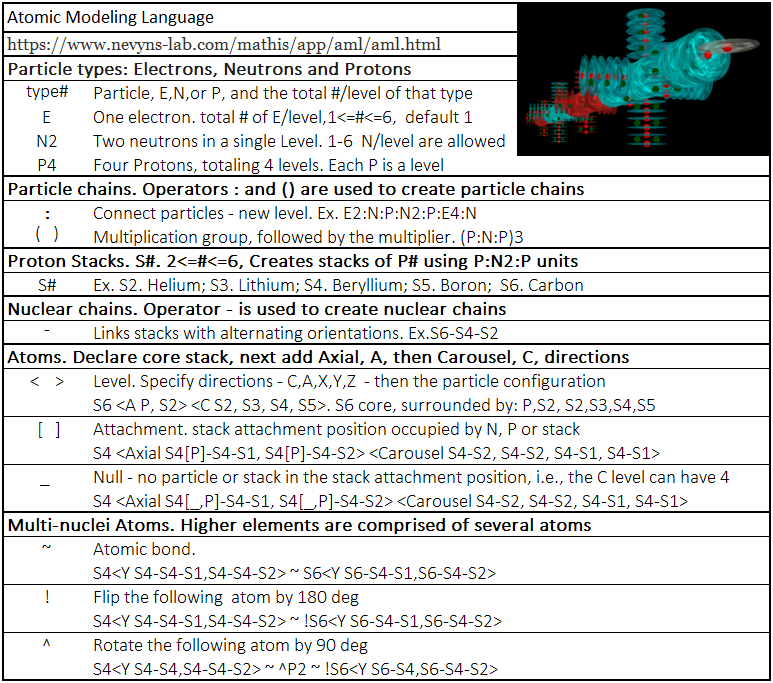 So the : is not really a part of the nuclear chain, but of the particle chain inside of it. There is some inconsistency in the headings. The first one uses a : to separate the heading from the description, but none of the others do. That is because : is a token of the language and it would be confusing to use for this purpose too. Maybe separate the heading from the description and put the description on a line underneath the heading, in a slightly smaller font. If you want, I will convert the above version into HTML which will be a lot easier to manipulate. Then we can play with it to get it right. When we are happy with it, you can create the final image. I can give you access to the AML BitBucket repository, if you want, so that we can work on the HTML version. Even though I will publish the HTML version, I also want to provide a link to the image as that will be better for printing, should the user want to do that. 1. Corrected “S() - Why does it have the parentheses?”. Replaced () consistently with #. 2. 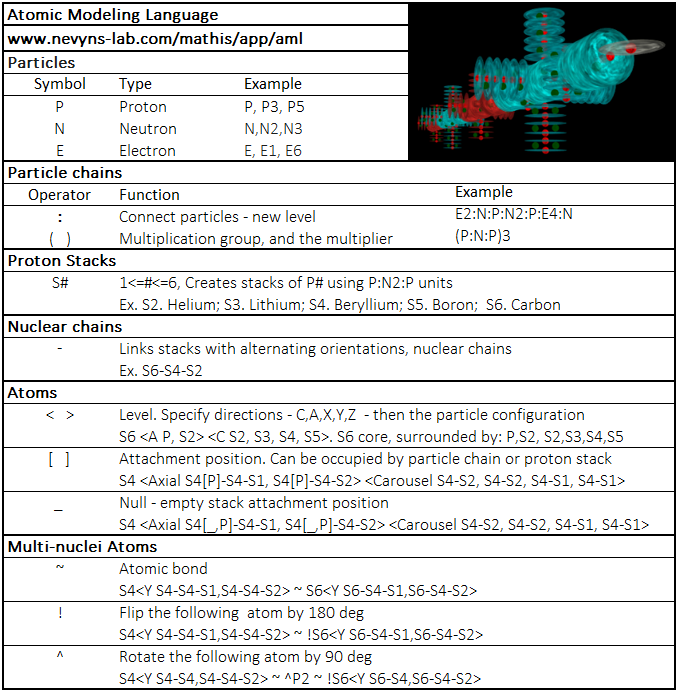 Corrected “Nuclear chains ...Remove the : ” by adding the word “Operator” – in two places. 3. Corrected more than one incorrect Carousel spellings. 5. Now that I look at it I see a : in Particle types:. If you want, I will convert the above version into HTML which will be a lot easier to manipulate. Then we can play with it to get it right. Ok. I'm surprised to hear that it's easier to deal with as an HTML file; I guess you're referring to the image. Of course I used excel, I could export it as a text or pdf file if you'd like. Please correct Beyllium spelling in Element Information. Ok, I thought you were just editing the images. HTML would still be better than Excel, as it is meant for displaying data, where-as Excel is meant for processing data. There are a lot more options, and better ways, to style the way it looks, if you know a little CSS. It is a bit harder to generate an image from though. Maybe some of the other sections could use a similar format. You are a tough reviewer, here's what appears to be a new draft final. I immediately see things - after I post. Here's a small correction to the previous. I like it. So much more clear and concise. It is very close. Is it possible to center the P, N, E symbols so that they line up with the rest of them in the other sections? - Already fixed before I can even post about it! Missed word in Attachment position 'Can occupied' instead of 'Can be occupied'. 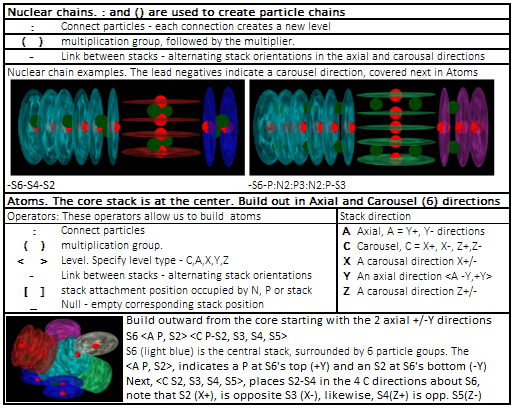 Also thinking that instead of 'N, P or stack', it could be 'particle chain or proton stack'. I think I've made all your requested corrections - except one, I'm easily confused. The quoted URL lacks the http and www prefixes which is included with the pointer, the actual address appears to be https. I included those parts since it's easier to edit any of that out than to add the text in. My apologies to everyone for the very repetitious images. I must admit, even though I like it, a very neat and clean reference sheet, not at all like my usual chaotic output - it pains me to post another very similar - repeat - image. With your permission, I'd like to go back and remove two or three of those prior images; or not. Just give me the sayso. To clarify, this image is a coordinated "draft final" for a single page reference of AML. Even without any additional changes, it will still be "draft final" since the "final" document itself must be an HTML document, when additional changes will probably be made. The important thing is the accuracy and format of the information provided. Repeat, thanks, I like it. Don't worry about all of the images. It shows progress. Most of the posts wouldn't make sense anymore if you took them out. If you want to reduce the clutter on the page, you could swap them to thumbnails instead of full sized images. Then the reader can click on them to see the full version if they want, or skip by it with little thought. Personally, I wouldn't bother. While I may create a HTML version, this image will still be available. A HTML version might contain a little bit more detail, so it could sit between this cheat-sheet and the specification. I envisage this as something that a user could print out and keep beside them for quick reference, where-as the HTML would be more of a 'I only know half of what I am doing' kind of thing. I don't really know at this stage. I have been thinking about a new AML app that allows you to create a Periodic Table of AML. The user will select an element to edit, the app will show the available isotopes of that element. The user selects the one they want to edit or creates a new one. Then they can enter the AML for that isotope. I have had a play with creating a UI for it, but ran into some road-blocks. I'm trying to re-arrange the screen layout to give more space for the 3D model too. Thanks for answering; I appreciate the bigger picture. Happy to be helping with fine subject matter. I believe I agree. 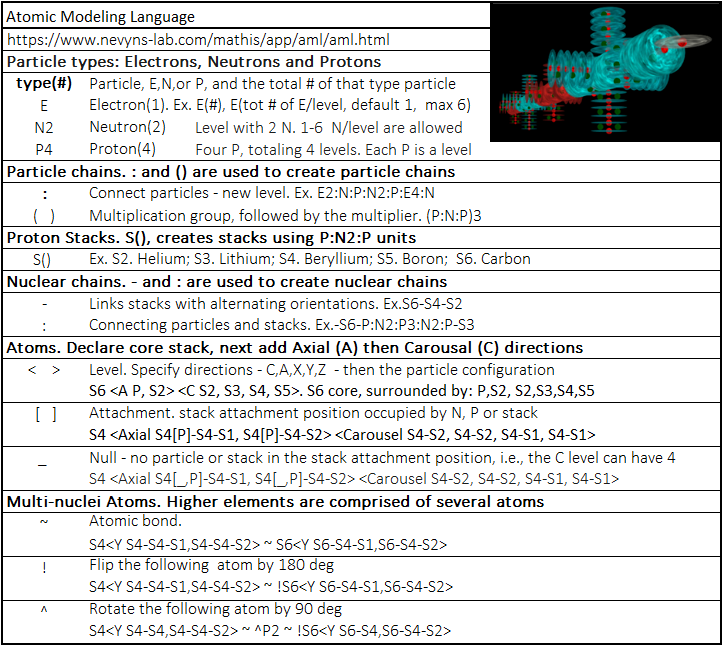 I would say, if you’re happy with AML, you have no choice, you should have the AML for all the elements/isotopes. Giving the user access to all the elements/isotopes to play with is a great way for AML to grow. Separately, the Periodic Table is either a list, or outdated table. I imagine the Periodic Table you developed way back when might also make a nice User Interface. Yeah, I thought about using that periodic table as a start. The user could click on the element they want to edit and it will move to the editor. But I think I want something that is a single app. Makes it easier to switch between elements and isotopes. I've whipped up another app to extend AML into a full table. Not only can you write an AML expression for each element, you can even write AML for each isotope of each element. It comes ready-to-go with all known isotopes, you just need to add the AML to complete the table. You can save and load the table to/from your local file system. It is stored in JSON format so you can look at it, even edit it, in any text editor. This app is a bit more complex than the other language apps, but I don't want to write too much about it so that I can see if it explains itself or not. Just select which element you want to edit, choose one of the available isotopes, and enter an AML expression. Ok, I've got the Periodic Table of AML in front of me but all I see an empty display. Selecting anything from the element and isotope pull down menus only changes the element name and proton/neutron counts listed - but no element/isotope or its AML appears. Am I expected to enter the AML code first? If so, why have pull-downs? Worse, from this display, there's no help and there's no AML code examples. I tried to reload the page to see the specification again so I can could copy some code to begin with, but the reload didn't include the intro information with spec link nor a way to get to it. I had to edit the url to get it back to the start intro, or start again in a different browser. I think what you missed is the word edit. This is not an app that will give you all of the elements. It allows you to create a periodic table. You define the structure of the elements and save it into the table. Then you can save to whole periodic table so that you can work on it again later. I've added a message dialog that pops up if there is no AML for the selected isotope. That helps to let the user know that they have to enter in the expression. I fear it will get a bit annoying, but don't see another way at the moment. I also added a button to show the initial dialog again. The reason the initial dialog didn't show up when you pressed the in-app reload button is because that button records the selected element, isotope and current AML expression to the URL. If any of those parameters are found on the URL, then it will not show the tutorial. This is because it assumes that if you are going to a specific element/isotope, then you don't need the reminder of how to use the app.